At long last, this east-of-the-Trail neighborhood is rising and shining. 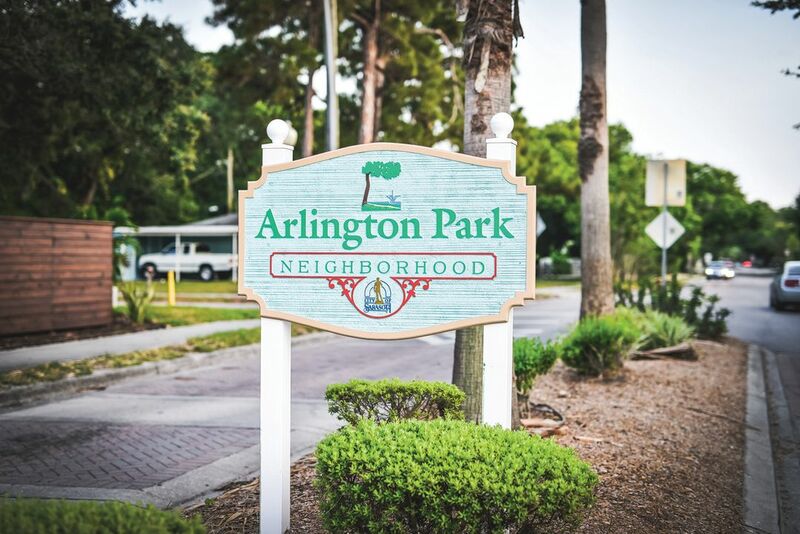 On a list of desirable Sarasota neighborhoods, Arlington Park has never rated very high. I remember considering it as a place to live when I moved here in the mid-1980s. The location was great—just south of downtown, on the east side of Tamiami Trail—and God knows it was affordable. But the houses were small and shabby, and there was a vibe of people living paycheck to paycheck. After one drive through I made an easy decision: just not nice enough. | Now, 30 years later, it may be the hottest place in town. The shabby houses are getting fixed up, infill homes are popping up everywhere, new people are moving in and change is in the air. The logical answer is that real estate’s oldest law—location—has taken over. Arlington Park is just too well situated. As commuting becomes a real issue in ever-growing Sarasota, it’s like a dream come true. Downtown and all its jobs are five minutes away. From the northern edge you can actually walk to Main Street. Sarasota Memorial Hospital, one of the area’s largest employers, is right across the street. And all the activity to the south, all the shops and business that line Tamiami Trail, are equally convenient. Real estate’s second law, affordability, has also come into play. Most realtors will tell you that Arlington Park housing is half the price of what you’ll find west of the Trail. While that’s not entirely true, it’s close enough. You can still get a nice little house in the low $200s if you look hard—“really hard,” as realtor Judy Nimz puts it. A whole army of people is combing the listings these days, analyzing everything in Arlington Park that comes on the market and trying to figure out how to make money off it. But the real reason Arlington Park has become a hot neighborhood is something else. As it transforms itself from shabby to chic you can feel a community finding itself. The upheavals and bad feelings that accompany change are largely absent. True, the old-time residents get annoyed by the nails in the streets from the new construction, and everyone bemoans the loss of some of the old oaks that give the area its shady, old-fashioned feeling. But most old-timers are welcoming the newcomers, as they realize that now more than ever Arlington Park is a wonderful place to live. For additional Arlington Park, Sarasota Real Estate information, please contact Oliver McConnell with McConnell and Associates at (941) 539-1916. Actually, it has finite boundaries. On the west is the Trail. On the north is Bahia Vista Street. On the east is Tuttle Avenue. And on the south is Webber Street. But by the time it gets to Webber, it has already begun its transition into Southgate, where the homes are archetypal Florida ranch homes from the 1960s and the walkability factor tapers off considerably. Classic Arlington Park, the “hot” part, is mostly north of Hyde Park. Here the houses started life in the 1950s as nondescript suburban homes. Some are a bit older, some a bit newer, but they’re all basic housing. They are plain and modest, with no flourishes, no distinguishing architectural details, no open kitchens, no walk-in closets. Many are 1,000 square feet in size or smaller. The passage of time has made many of them quaint, though. The nicest radiate charm and character, and the total lack of pretense gives them an honest quality that attracts many people. Who, exactly? For many years the neighborhood has been home to the town’s middle class—the teachers and nurses and office workers. But it’s also appealed to artists and intellectuals. Richard Glendenning, the well-known writer and a close friend of mystery author John D. MacDonald, lived on Hillview back in the 1960s and ’70s. 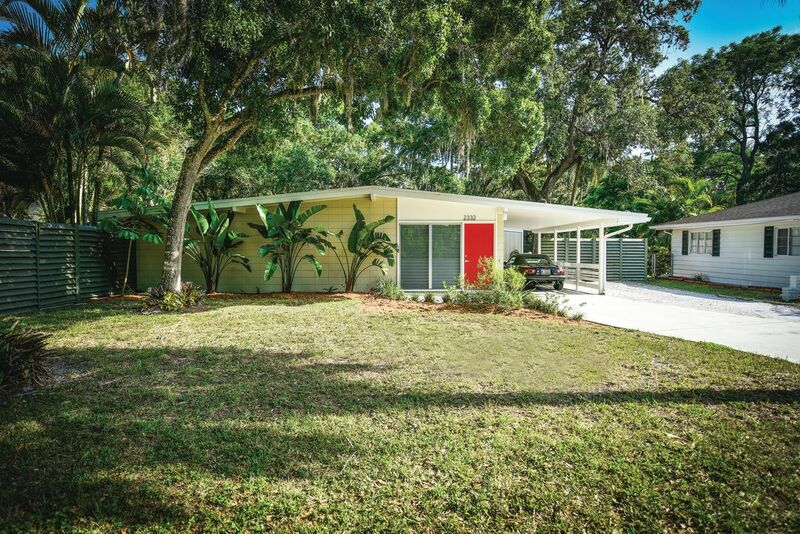 Jay Handelman, theater critic for the Herald-Tribune, has been there 23 years, in a solid bungalow from 1949, with an interior paneled in dark, glowing wood and decorated with lively modern art. Other noteworthy residents include Ken Bowermeister, who just retired after many years conducting the Venice Symphony, and—until recently—architect Stuart Barger and his wife, actress Patti O’Berg, who, after decades in a sprawling ranch home on Hillview, have moved to New Mexico. The Barger home, an anomaly for the area, is a 3,267-square-foot ranch that was redone in the Craftsman style and sprawls across three lots; it’s currently on the market for $574,900. Virginia Hoffman bought the home she shares with husband Jerry Meketon, a psychologist, back in 1988. Virginia, an artist who specialized in custom metal work for the town’s top decorators, now works mostly in photography. Over the years she’s developed quite a reputation as a political gadfly. Never one to back away from a fight, she served on the city’s Public Art Committee, and was a founder of CLUCK, an organization that lobbies for the right of local residents to keep chickens in their back yards. Virginia’s own back yard is one of the nicest in the area. 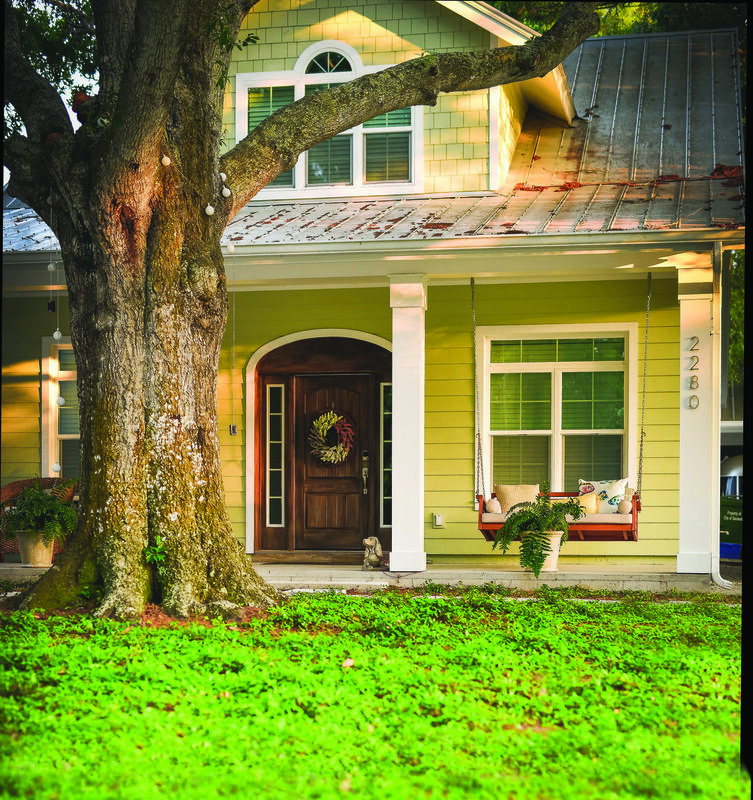 Under the shade of big oak trees, native plants are grown organically, and the property merges an Old Florida aesthetic with modern eco-techniques. A park across the street from the Hoffman-Meketon home, appropriately named Arlington Park, is the neighborhood’s crown jewel. 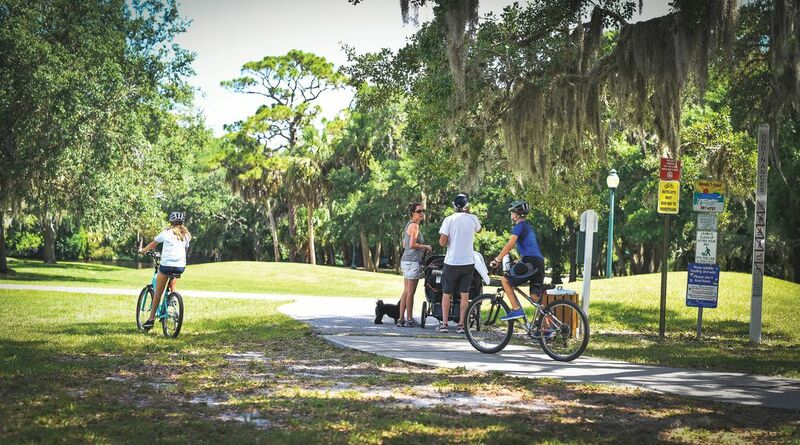 Sarasota has nice city parks, but none more successful and well-loved than Arlington Park. “It’s like a country club but very much in context with the neighborhood,” says Hoffman. It offers a 50-meter lap pool, basketball and tennis courts, an indoor gym with weight room and a dog park. The park is an enormous plus for the young families in the area. Michael and Laura Gilkey have lived here since 2002, and their two young sons ride their bikes there, exploring the paths and duck ponds. Arlington Park is a gold mine of family amenities. It’s located in two very good school districts—Alta Vista and Southside—and also has the Goldie Feldman Academy, a private Jewish grade school at its northwestern edge. And if the activities at the city-run park aren’t enough, there are even more at the Sarasota Y on the corner of Bahia Vista and Euclid—sports teams, classes, a gym, camps and more. Perhaps no other part of town is so family-friendly. The housing choices in Arlington Park fall into three general categories. First come the original homes, the small houses from the 1950s that make up most of the housing stock. Anything under $200,000 is generally considered a tear-down. The ones that have been well maintained and updated—but not enlarged—start around $225,000. There’s one at that price point currently available at 2263 Temple St. The floors are terrazzo, the kitchen is new, and there are three bedrooms and one-and-a-half baths. It’s a nice little house, although with just 1,000 square feet, the scale is relatively small. For a more elaborate remodel, check out 2575 Hyde Park St. Here we have three bedrooms, three baths, a nicely redone kitchen, a caged pool and 1,881 square feet of living space. It’s listed at $349,000. And for a super-deluxe renovation take a look at 2340 Hillview St. From the street it appears small and simple, but inside things open up thanks to an addition to the rear with a new kitchen, family room, and master suite. The home is spacious—over 2,000 square feet—and inside everything feels brand-new and high end. There’s also a large new swimming pool, somewhat of a rarity in the area. It’s listed for $569,000. What is attracting attention, though, are the new infill homes. No one is claiming that the old 1950s homes are architectural statements worth preserving, so the usual sighs of lament when nice old homes are torn down aren’t being heard in Arlington Park. Old-timers are glad their property values are going up; and the new homes, while often crowding their lots, remain basically in scale with their neighbors. As a result, Arlington Park is attracting a new demographic. People who would normally seek out Sarasota’s West of Trail neighborhoods, traditionally more upscale, are looking at Arlington Park with new eyes. At a recent open house, I bumped into Mel Davis, a former model who runs SRQ Locations, a company that provides locations and production services for movies and fashion shoots. Mel, tall with tawny blonde hair, personifies West of Trail chic. She just sold her house in Cherokee Park and has been watching what comes on the market in Arlington Park. Her dream: “an older house I can put my own touches on.” It also helps that two of her kids attend Sarasota High, just a short walk away. If Mel instead decides on a new home, she’ll have plenty to choose from. A number of builders are snapping up the tear-downs and replacing them with big, two-story homes. A typical example is the David Weekley Sandpiper model at 2511 Prospect St. Its exterior style might best be described as “Craftsman/Coastal,” with a gabled roof and shingle detailing. Inside everything is impressively light and bright, with high ceilings, an open plan and premium tile floors. Upstairs are four bedrooms and a bonus room. The home is similar in feeling to its cousins west of the Trail, where the new homes start around $800,000 and quickly shoot up to more than a million. The price of the Prospect Street house? $570,000. It’s appealing enough to make you seriously reconsider your plans to find an old cottage. The most interesting of the new homes are being built by a company called Courtyard Modern. Here the idea is modern architecture—geometric shapes and volumes, simple but elegant finishes, white exterior walls. It’s a conscious nod to Sarasota’s architectural heritage and a way to give the homebuyer good-quality modernism without the expense and hassle of hiring an architect and designing from scratch. Courtyard Modern is the brainchild of Joe Russo, who handles the business side of things, and Cheryl Blankenship, who is the designer. “It started out as a fun project,” Cheryl says. “We didn’t think it would catch on.” But it has. They’ve built and sold more than 10 homes in Arlington Park and are now branching out into other parts of town. The typical Courtyard Modern home has all the design features that a modern architecture aficionado is looking for. The entire lot is designed and landscaped to fit in with the house itself, with shell, grass, lighting, plants and rocks as part of the look. Inside, ceilings are high and the details are crisp and elegant, with trendy touches like barn doors and polished concrete floors. There is no set model. Each project is original and the buyers can individualize their new homes with options and upgrades. The homes usually start around $600,000. A classic midcentury home on Hawthorne Street. Even if you’re not interested in real estate in Arlington Park, I suggest you take an afternoon off and wander around. Check out the group of five or six homes in the 2300 block of Hawthorne. They appear to be Sarasota School homes from the 1950s, tiny versions of the town’s more famous masterpieces in fancier neighborhoods. They’re clearly related and were built at the same time. Who designed them? What’s their story? I smell a research project for the graduate students at the Center for Architecture Sarasota. And look for the slightly psychedelic blue A-frame at the corner of Temple and Jefferson. What aging hippie wouldn’t want to live there? Keep your eyes open for the handful of bungalows from the 1920s that still dot the area. And make sure you check out the three-block stretch of Lime Avenue between Hawthorne and Hyde Park. It’s like the picturesque alleyways you’d find in an old Florida town. Most of all, make sure you stroll through the park. It’s tucked away in the middle of things; from the various streets that border it you get little idea of the beauty inside. A walking path meanders for a half mile or so, past green lawns and little groves of trees. A surprisingly large pond is smack in the middle, with turtles sunning themselves on the banks and a sign warning of alligators. Nurses from nearby doctors’ offices are eating their lunches, and dog walkers are everywhere. Arlington Park, hiding in plain sight for so many years, is finally coming into its own. It’s becoming a cross-section of creative Sarasota. Take the Gilkey family. Michael is a landscape architect. Laura is an advocate for maternal and infant health and a co-host of Maternally Yours, a program on local community radio station WSLR. (Both their boys were born at home.) Their neighbors include a Pilates instructor, an acupuncturist, a family in the restaurant business, a police captain, and a nice old lady or two. Everybody looks out for each other. “We call each other if the dogs get out,” Gilkey says. But it goes deeper than that. The Gilkeys’ son, Benjy, 8 years old, was recently diagnosed with leukemia. When he came back from the hospital after his first round of treatment, all the kids from the block were lined up to welcome him home. You’ve got to love a neighborhood like that.